1. What kind of pillar that moves? 2. Why is 6 afraid of 7? 3. What is the only letter in the alphabet that you can drink either hot or with lemon and ice? 4. What did Friday and Saturday had for dessert? Story: Despite of the usual protagonist has to solve puzzle king of thing , it was still outstanding since in every plot things get leveled up, as if the anime itself get renewed with the twist that come around as the protagonist gets to faced different adversary. Also, the story itself is a puzzle as to which we the audience empathize with the characters predicament of solving puzzles, there is also the part that it gives us audience such desire that the adversary goes down with the puzzle, but in this third sequel the plot thickens as the protagonist has to go against the person he cares about, which basically adds to this anime's excitement. Overall: I'd probably say, that this anime is way too outstanding since it did end in a good note. Art: I'd never understand as to what's with Kaito's gangsta look? He kind of looks like a delinquent who always has a bad hair day. Gamon, on the other hand looks like some biker dude who has an S & M fetish, Nonoha, though she looks hot in her school uniform, her hair style is horrible. 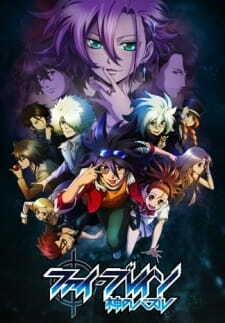 You know what, whoever is the illustrator of this series probably has a hair problem as well, co'z nearly every main character in this "Phi Brain" serial looks like they're having a bad hair day. Also Ratsel outfit, I just don't know what to make of it, she kind look more like a circus performer than anything else. I just don't have anything to comment about the VA's nor the opening and closing songs. Character: though, Kaito is great, he kinda annoys me since he never notices Nonoha's feelings for him, also, though I like his "can do" attitude, his fashion sense is horrible, then again his character is outstanding as he plays as to what was expected of him. About Nonoha, I kind like that she plays like a mom figure to Kaito despite of being the same age as he is, now only if Kaito would notice her feelings for him, Gamon.....well he is ok, and so as Cubik, Ana, Rook, Freecell, Elena, the Principal and Souji. But more credit goes to the antagonist like Enigma whom I'm glad he got what he deserve, Jin whom at first we though was the victim but turned out to be Orpheus and Ratsel who played as a very formidable opponent of Kaito, which in the end she got saved by the latter. Enjoyment: very enjoyable and that all I have to say.